Inside the National Air and Space Museum is a drone exhibit (Predator drone included) that ignores the civilian deaths Obama's and Bush's armed drones have caused while glorifying military drones in general. 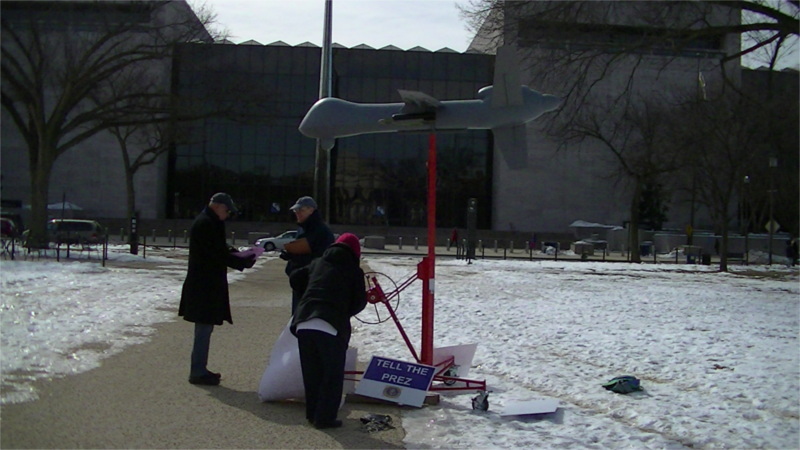 On Feb 28, protesters showed up with leafets, signs, and a mock drone in front of Air and Space. 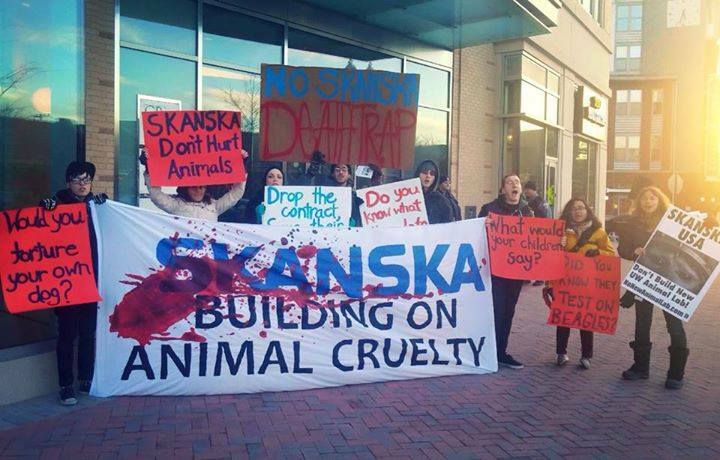 On the 6th of February, activists from DC Stampede showed up a the Virginia offices of Skanska. Skanska calls themselves a "world leading project development and construction group." Skanska has a contract to build a new, $123 million "Animal Research and Care Facility," meaning a vivisection lab at University of Washington. Dogs, cats, primates, and other animals will be imprisoned there until they are tortured to death in the same of "science." Two protests were held on Feb 6: At about 9AM, nine activists got inside the building and managed to create enough disruption to close the 2nd floor of the building. Cops were stationed outside all day after that, yet activists returned in the afternoon for a round of leafleting. Dominion is not only building a fracked gas export plant at Cove Point, MD, they also are seeking to build the "Atlantic Coast Pipeline" to transport some of that fracked gas. 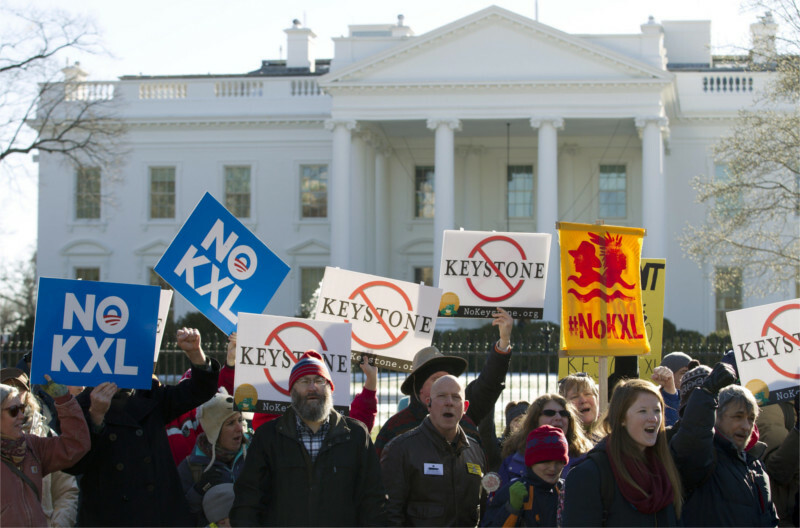 The pipeline would desecrate Native American burial grounds as well as promote more fracking. 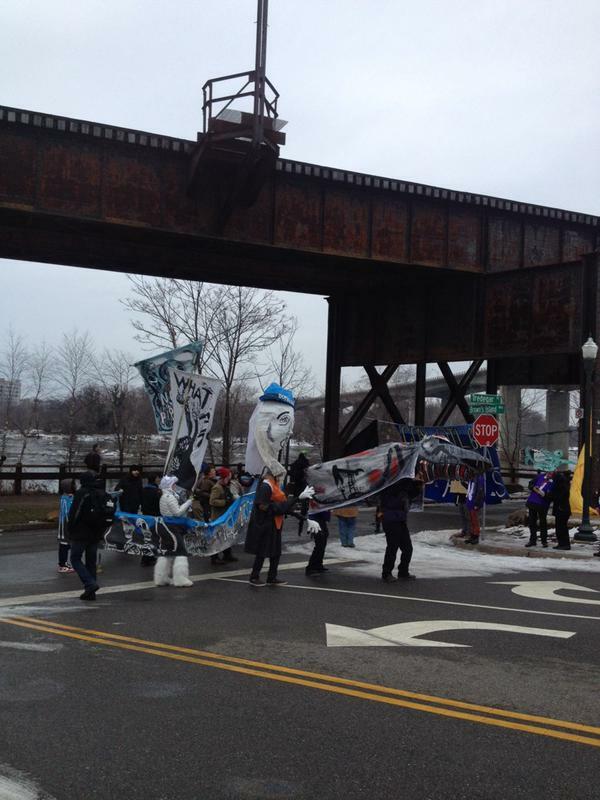 Shortly after 7 AM on the 23ed of February, over 50 activists blocked off access by car to Dominion Resources’ Tredegar Campus in Richmond, Virginia. On the 22nd of February, DC Ferguson met at the Congress Heights Metro in Anacostia and marched on the 7th District police station. 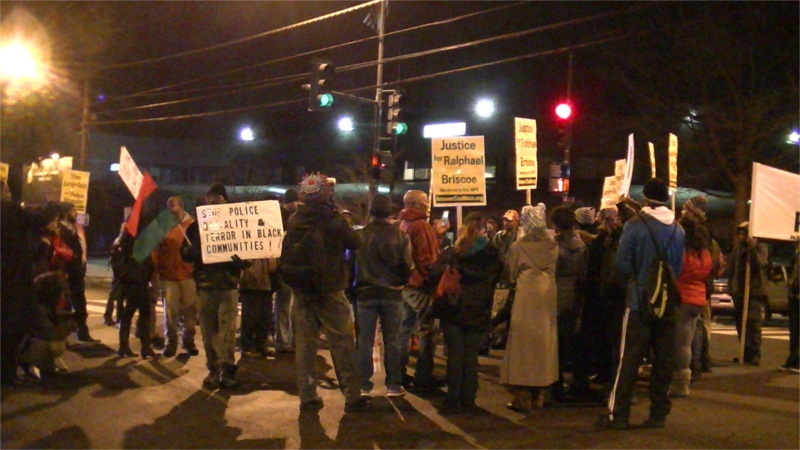 Protesters were demanding justice for Ralphael Briscoe, who was shot in the back by a police "jump-out" squad back in 2011 without having even been suspected of having committed a crime. The shooting was described by one speaker as being a "drive-by." As usual, the police involved in this murder have been cleared of all charges and returned to duty. DC Ferguson is demanding that these murderers be punished-and that police jump-out tactics be ended in DC forever. On the 18th of February, Obama began his "countering violent extremism" summit, which is mostly an event to coordinate police efforts to spy on and infiltrate Muslim communities. 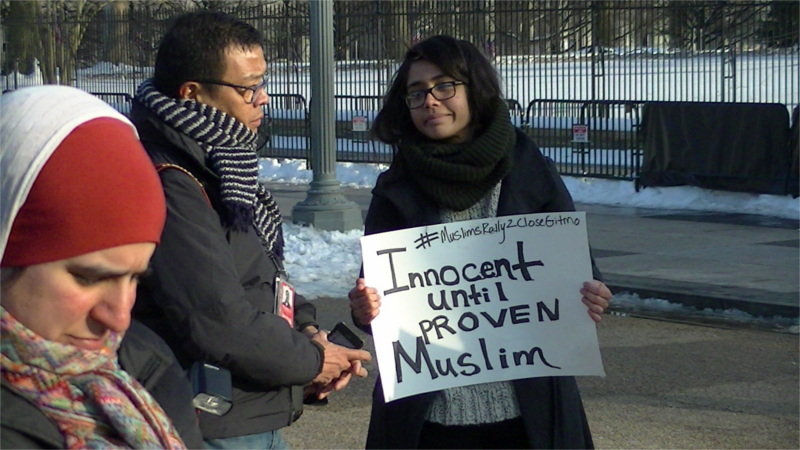 Outside, both Muslims and DC Ferguson activists called out this event for hypocrisy. The US itself was called out for the drone strikes used for extra-judicial executions throughout the Muslim world. This was compared to the routine and never punished street executions of African-Americans by killer cops, often by jump-outs in DC. Lastly everyone was reminded that the profile of almost every terrorist in the US has been an angry, armed white male. This includes last week's murder of three Muslims by a terrorist in North Carolina. No doubt Obama's summit will pay little attention to the ongoing drumbeat of mass murders by angry white men in the US. On the 16th of February, DC Ferguson released a statement condemning the refusal of a Federal jury to hold DC cops even civally liable for the murder of Ralphael Briscoe during a "jump-out" attack by the police. Once again there is no justice for those murdered by the police, just the people. DC Ferguson has also called for a rally and march on Sunday, Feb 22 at 6PM starting at the Congress Heights Metro station. This protest will march to the 7th district police station. The vigils against armed drones continue at CIA headquarters, 10 AM on the second Satuurday of each month.This month as always the vigil triggered the closure of the Dolly Madison Ave entrance to CIA for several hours. One focus of the February 14th vigil was the killing of 12 year old Mohammed Saleh Qayed Taeiman by one of these drone strikes in Yemen on Jan 26. Somehow the CIA identified him as one of three "al Qaeda militants" targeted for extra-judicial execution by armed drone. On the 13th of February, there were Global Divestiment Day actions in over 200 cities just on Turtle Island demanding that institutions divest from fossil fuel corporations. 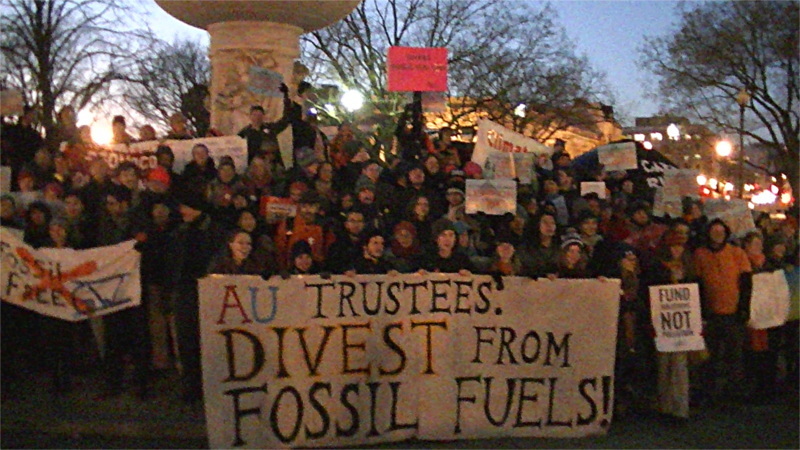 Here in DC, AU students and many others demanded that American University withdraw all of their investments from the fossil fuel industry. One speaker bluntly invoked the sucessful divestment campaign that forced South Africa to dump Apartheid. Another model, not mentioned at the protest would be the campaign against Huntingdon Life Sciences that made them too hot for almost all financial institutions to handle.